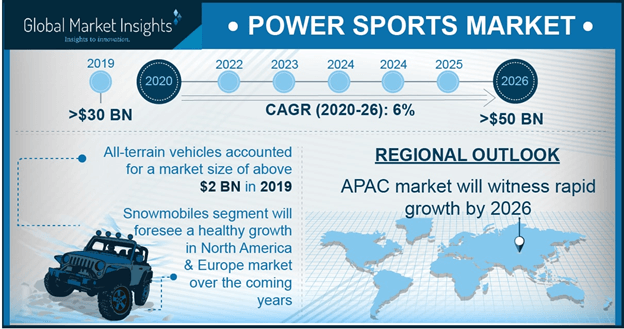 Power Sports Market size valued at over USD 11 billion in 2018 and is estimated to exhibit around 4% CAGR from 2019 to 2025. Growing penetration of off-road recreational activities across the globe will propel power sports market share over forecast period. Increasing outdoor recreational facilities such as theme parks, wilderness areas and trails are positively influencing the product demand. In July 2018, Toowoomba Regional Council, Australia announced a grant of USD 27,000 to develop off-highway motorcycle track. Ongoing initiatives to support participation in off-road activities will fuel the industry growth. Rising per capita recreational spending with increasing disposable income are inducing significant potential in power sports market share. As per the U.S. Commerce Department, in 2018, the gross domestic product rose by over 4% annualized rate. Countries including the U.S., and Australia are witnessing high participation in outdoor recreation on public lands and waters. As per the U.S. Outdoor Industry Association, in 2017, the off roading and snow sports retail spending accounted for over USD 50 billion and USD 70 billion respectively. Growing presence of ATV and snowmobile clubs across the globe is encouraging the engagement in off-road leisure activities. Promotional campaigns and events are escalating the youth participation in racing activities, supporting the power sports market proliferation. For instance, in 2017, the Australian Off-Road Vehicle Association offered free passes for ATV, UTV and off-road vehicle enthusiasts. Further, increasing racing championships including National Motocross Championship and Mud Racing Championship across diversified regions will provide potential growth prospects for the market size over the forecast timeline. Increasing availability of numerous vehicle models through multiple distribution channels coupled with easily accessible finance options are supporting the product demand. Moreover, introduction of advanced vehicles offering multi-drive mode functions and comfortable riding experience are positively influencing the market share. In September 2017, BRP introduced new model Defender XT-P equipped with multiple driving modes and upgraded shock absorbers. Ongoing technological advancements in quad bikes for superior efficiency and durability will boost the product penetration over the study timeframe. Incorporation of independent suspension, hydraulic disc brakes, automatic transmission drives and power steering are enhancing the vehicle performance. Moreover, increasing utilization of hybrid powertrains to eliminate excessive noise and obtain higher torque output is propelling the power sports market size. High ownership cost in conjunction with increased carbon emissions may restrict the market growth over the forecast timeframe. Rising fatalities owing to ignorance of safety equipment and lack of proper safety training are limiting the industry size. However, government bodies across the globe are promoting safety training programs and campaigns prior to driving power sports vehicles. Further, several countries are mandating the completion of safety programs and usage of safety gear for drivers under the age of 16 years. Side by side vehicles holds significant share in the power sports market size owing to installation of structures including roll-cage enclosures and individual seatbelts for superior safety. Utility vehicles offer comfortable riding experience for multiple passengers along with larger storage space. Introduction of new product from major industry participants such as Polaris Industries, Bombardier Recreational Products (BRP) are strengthening the segment penetration. For instance, in November 2017, BRP introduced Can-Am ATV line-up equipped with ABS technology. Personal watercrafts will exhibit over 4% CAGR in the market size owing to low initial cost compared to other water-borne vehicles. Potential weight savings offered by personal watercrafts are providing higher power-to-weight ratio and fuel efficiency. The watercraft offers superior manoeuvrability and cornering. Moreover, rising deployment of personal watercrafts for coastal patrolling activities will strengthen the power sports market share over the forecast period. For instance, in July 2017, Royal Gibraltar Police Authority deployed personal watercraft for enforcing navigation rules and patrolling local beaches. Snowmobiles will witness substantial growth over the study timeframe owing to increasing snowmobile trails and racing events. Availability of multiple models with diversified engine alternatives including two-stroke and four-stroke technology coupled with multiple seating configurations support the segment penetration. Wide presence of snowmobile clubs involved in maintenance and development of trails, fund raising activities and sponsoring outing programs will drive the segment size till 2025. 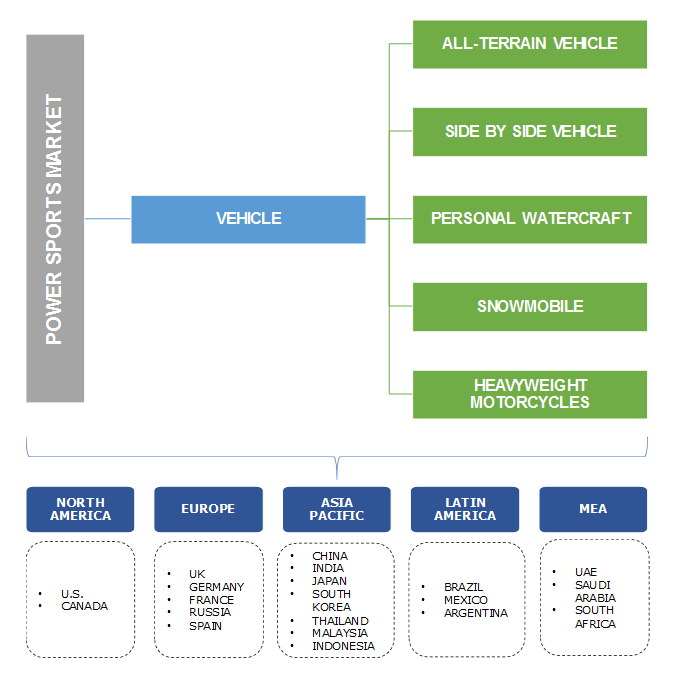 In 2018, North America accounted for over 60% share in the power sports market size with presence of major industry participants including Polaris Industries, BRP, Harley Davidson, and Arctic Cat. Vast presence of theme parks and public lands managed by the authorities including the U.S. Recreation and National Marine Manufacturers Association (NMMA) is promoting participation in off-road driving activities. Europe holds substantial share in the market size owing to increasing consumer spending and proliferating tourism industry. Presence of snowmobile trails and clubs will induce significant growth potential over the study timeframe. Further, supportive government initiatives for trail development in the countries such as Russia and Sweden will augment the industry size. Asia Pacific power sports market share will witness over 4.5% CAGR owing to the increased adoption of ATV’s and SSV’s across the region. Industry players are strengthening distribution and sales network to enhance the availability and accessibility for powersports vehicles. In June 2014, BRP established joint venture with its distributor in China to strengthen its presence in Asia Pacific. Moreover, ATV events organized by adventure clubs are supporting the power sports vehicles demand. Major power sports market participants include Yamaha Motors, Arctic Cat Inc., Polaris Industries, Honda Motors, Kawasaki Motors, Harley Davidson, BRP, Suzuki Motors, John Deere, Kubota and Kymco. Industry players are continuously investing in R&D activities to introduce efficient turbocharging solutions for power sports vehicles. In 2016, Yamaha introduced the Genesis 998 turbo engine for snowmobiles delivering enhanced torque and power output. Manufacturers are continuously striving to deliver customized vehicles incorporating advanced design and transmission technologies to enhance the driving experience. Power sports industry includes vehicles adapted for sports and recreational activities. Regulatory norms and standards pertaining with vehicle emission are defined by United States Environmental Protection Agency and Code of Federal Regulations. Stringent regulations regarding operational permits, registration, and insurance for power sports vehicles ensures safe and responsible driving. Manufacturers are indulged in developing engines that comply with emission standards for environment safety.